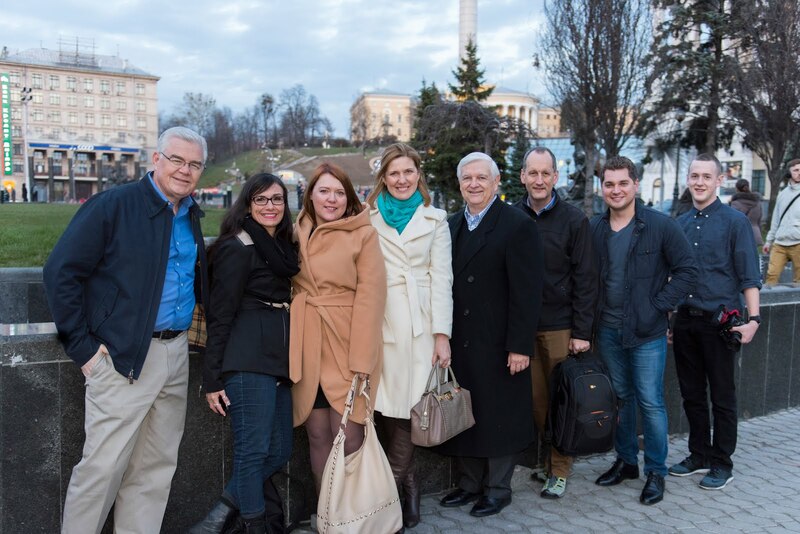 I was invited by Ron Harris with MediAlliance to speak and teach at the Novomedia conference in Kiev, Ukraine at the end of March 2016. The people I met were wonderful Christians excited about sharing Jesus with others through media, and are high-level media producers. It was a privilege to share with them my experience and a few pointers on making better video and just communications in general. They seemed to really appreciate the church perspective that I brought to the conference. I was honored to be speaking along with excellent instructors: Lee Ann Jackson, and Wes Ward. See Graham Ward's excellent video of the conference. Especially meaningful to me was Victor Titarchuk who translated for me. His 12 years in Texas gave him the inside track on translating my Southern drawl! And I especially want to thank Ruslan Storchai for organizing Novomedia. His zeal and drive to share Jesus through media encourages me and all of those around him. Olga Bidnenko, Ron Harris, Wes Ward, Nathan Woodward, Graham Ward. Below are links to the Power Point presentations I showed at the conference. Some details are missing that were spoken in the lecture, but to those who attended it will be meaningful. These Power Point presentations include translations for Ukrainians. Do you like to know what's going on? Me, too. I like to have the latest information. There's a certain confidence that comes with being "in the know." I can be the answer man. Who would want to answer every question with "I don't know." But let me ask you, what don't you know? If you have trouble answering that question then you might want to dig a little deeper. You've probably heard people say, "As a teenager my parents were idiots, but in just a few years they wised up!" Youth and inexperience often breeds arrogance and a "know-it-all" attitude. But it's not limited to teenagers. Anyone can act that way. I certainly have. Researchers have shown that this attitude of illusory superiority causes people to mistakenly rank their abilities too high. Read about Dunner-Kruger effect. Have you ever prayed for wisdom? I hear it all the time and I just began to wonder what exactly people wanted when they prayed that prayer. Superior knowledge? Ability to anticipate things/people? The right words at the right moment? Certainly wisdom is all of those things, but could it be that God's wisdom blessing is to show us what we don't know? Proverbs 9:10 tells us that fear of the Lord is the beginning of wisdom. I can't fear God and be arrogant! I have to be humble. And sometimes that means not always having the answer, but we need to be humble and rely on the Lord. And it causes us to be less self-reliant and pushes us to seek God and to engage and motivate people. Of course, there's no excuse for not doing what's necessary to stay on top of things. That's not my point. I need to be humble enough to rely on God's help, to engage and motivate people, and to focus on what my team/organization is doing, instead of how I look. I have been full time in church media and communications since 1983. From running a printing press to running a camera or operating a sound board or hanging lights I've done just about every job in churches in Louisiana and Tennessee. I've been a frequent consultant on lighting for television, directing, IMAG installation and presentation, and production team analysis. I've spoken at various conferences, served on the NRB Church Media Committee, and served as president of the Metro Media Ministers Association. My interest vary - scuba diving, flying, photography, and travel. Best thing of all - God in my life, Christ as my Savior, and the Holy Spirit as my guide. My wife is my best friend. My children are great people and my granddaughters are precious! God is good.